It can be so frustrating trying to grow your hair out and wait what feels like forever just for your hair to grow a few inches. The average length that hair grows every month is approximately half an inch. If you take care of your hair and your body, you may be able to increase that rate while keeping your hair looking beautiful. There are definitely some things that you can do to make your hair grow faster and it doesn’t involve any chemicals or treatments that are harsh on your body or hair. 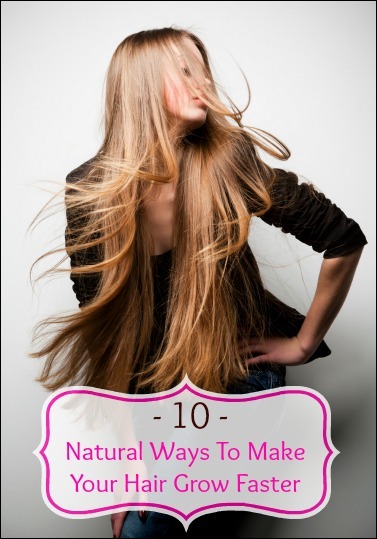 Here are 10 natural remedies to make your hair grow faster that will also keep it healthy as well. Massaging your scalp helps to promote more blood flow to the scalp. This increased blood flow stimulates the hair follicles under the skin and can promote more growth because of the stimulation. It’s really simple to massage your own scalp or you can go to a professional who can do the scalp massage as well. If you want to do your own scalp massage simply take conditioner or make your own hot oil treatment and rub into your fingertips. Then move your hands in a circular motion all throughout your scalp. This could be done right before showering or you could have someone do it for you. You could also do a quick scalp massage while shampooing and conditioning your hair every other day as well. Eggs are great for your hair because they have a bunch of protein that makes hair stronger and healthier as well as promotes growth. It’s quite easy to make your own homemade egg mask as all you need is a yolk of an egg, a tablespoon of extra virgin olive oil and few drops of lavender oil (optional). Mix all the ingredients together and apply it to the root of your hair by your scalp and then all the way down the hair. Leave it on your hair for 20-30 minutes and then rinse it off. Then shampoo your hair as normal. You don’t have to be pregnant to take a prenatal vitamin as the folic acid and the B vitamin that are commonly found in prenatals are great for promoting hair growth. If you have been pregnant before or know someone who has, it’s most likely that while on prenatals that person’s hair grew pretty fast. This is pretty common and it is not just due to pregnancy hormones but is due to the folic acid and B vitamins. Consult your doctor first before starting any type of vitamins. Another great hair mask that you can make at home to help get your hair to grow faster is an aloe vera hair mask. Pure aloe vera helps hair grow faster and also prevent hair loss making your hair much stronger. To make the aloe vera mask, combine aloe vera (not lotion but pure aloe vera) with half part lemon juice and leave it on your hair for 20 minutes. Then wash it out and shampoo as normal. If you have color treated hair and don’t want to use lemon juice you can also combine the aloe vera with coconut milk instead. Just like scalp massage, brushing your hair for a few minutes every day can also stimulate blood flow in the scalp and the hair follicles. Be sure to brush your hair gently and it’s not a bad idea to do it when it is wet so that you don’t break off the hair and damage it with the brush. You may even want to consider buying a detangling brush that is gentle on your hair. Keeping your body hydrated is very important when it comes to having healthy and long hair. If your body is dehydrated, it will start to show in your hair as your hair will start breaking off. Water also helps to flush out toxins in your body, which also helps to promote healthy growth of your hair. You should aim for around 8 cups of water a day to keep your body hydrated. Just like the folic acid in vitamins can help your hair grow faster, so can plenty of protein in your diet. Protein is not only good for your body but also is great for your hair as well. It helps make your hair stronger and can definitely make your hair grow faster. Protein rich foods include fish, eggs, poultry, green vegetables, and lean cuts of meat. Try an all natural hot oil treatment by using grape seed oil. You can follow the scalp massage directions above and use grape seed oil to stimulate the hair follicles. This can be done every other day and helps strengthen the hair shaft as well as promotes faster growth of the hair. If you hair starts getting too oily from using the hot oil treatment, you can cut back to only 2 times a week and still get great benefits for your hair. Some of the silicon based hair products may sound really great with them being able to tame flyaways or help your hair stay curly, but if you are trying to grow your hair long you will want to avoid using them. The products actually coat the hair shaft, putting up a barrier that doesn’t allow moisture into the hair. As mentioned your hair needs moisturize to stay healthy and prevent breakage. Also, these products tend to clog up hair follicles preventing them from actually being able to grow at all. Getting a regular hair trim approximately every 8 weeks may not make your hair actually grow faster, but it will help it look much healthier as it grows out. What is the point of growing out your hair if all the ends are broken off and damaged? When going for a trim, make sure that you stress to your hair stylist you only want the ends trimmed and nothing more so she doesn’t accidently end up taking off more than what you need to have cut off. The healthier your diet is, the healthier your hair is going to be. Your diet not only affects your body, but is also affects your hair and how much it will grow as well as how healthy it is. If you really want your hair to grow faster, try replacing some of the junk food in your diet with more vegetables and fruits. Eliminate most processed food that is high in sugar and sodium and instead try adding more fresh foods. Your hair and your body will thank you for it.